About an hour into Youth, I had decided that I didn’t like it. The pace was choppy, the mood all over the place, the characters odd, the true point obscure, and the general feel that of a Wes Anderson wannabe. By the end, I had changed my tune. Once I settled in, I began to understand the odd choice of characters, the leaping about, the vision, and to respect that Sorrentino was crafting something original before my very eyes. And after reflecting, I feel quite certain that a second viewing of this film would lead me to love it, with its cleverly hidden message and quirky side stories. Youth is a movie unlike any I’ve ever seen before, something worth the work it takes to understand. Retired orchestra conductor Fred Ballinger is on annual holiday to the Swiss Alps, vacationing at a swanky hotel that caters to the rich & famous. His daughter Lena has come along as well, acting as Fred’s assistant and managing his appearances, which are limited these days, by Fred’s direct choice. He won’t even conduct a symphony for the Queen of England, for personal reasons, so he says. Also at the hotel are legendary film director Mick Boyle, screen actor Jimmy Tree, the newest Miss Universe, and an unidentified but extremely well-known South American celebrity. Upon this lovely setting, love stories unfold, life-altering decisions are made, and Fred faces the inevitable & quickly oncoming end of his days. This would be the first film that I have ever watched twice and came back to change the rating of, if that happens the way I predict that it will. I just have the strongest feeling that I missed much in the first half of the film, that I was too critical of the wacky mood, that I didn’t understand what was being said. When I began to catch on, I began to fall in love with the film, only to have it end too soon. 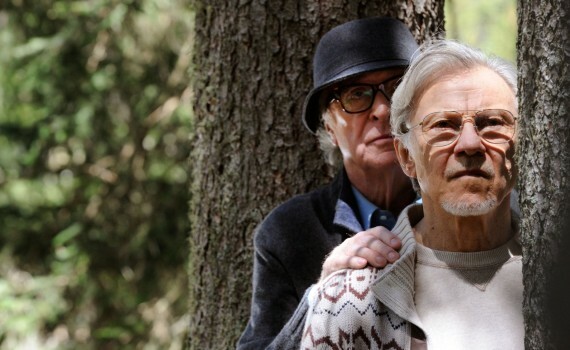 Michael Caine & Harvey Keitel were the perfect pair of storytellers, friends growing old together and facing the harsh realities of their approaching deaths. But that’s not complete, because they stopped to look back as well, not with flashbacks but with memories, and with the lives of the younger characters in the periphery becoming living examples of the best of days. The film still does ring with a slight Wes Anderson sound, which is probably why I can’t stop thinking about it, but it was nowhere near the theft I was imagining while I was having a difficult time connecting. Excellent acting, surprising humor, volumes to say; Youth is a movie I will be rewatching soon & often.